Jonathan Bailey of Plagiarism Today called Crazylarry23 “the stupid plagiarist”. Mark Graban of Lean Blog seemed surprised that an example of postgraduate level cheating was up on Freelancer.com. He also acknowledged Michel Baudin for originally publicising this attempt at contract cheating, although that blog post no longer seems to be active. As an academic, who along with Robert Clarke, has collected together a database of over 19,000 attempts at contract cheating, cases like this are not so surprising to us any longer. For the uninitiated, contract cheating occurs when a student gets a third party to produce assessed work for them. 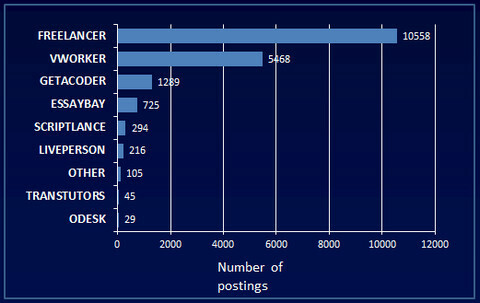 We can trace over 50% of the cases we’ve identified back to the Freelancer.com agency website, as this analysis of observed contract cheating between March 2005 and June 2013 show. This isn’t a completely scientific sample, since Freelancer.com is one of the main sites on our contract cheating radar, but perhaps that’s why Jonathan Bailey labelled anyone using this site to cheat as “stupid”. More details relating to this data set are academically available in our recent paper, “Commercial Aspects Of Contract Cheating” and several examples are expanded upon in Slides From Recent Talks by Dr. Thomas Lancaster. The reaction to the case of Crazylarry23 does reflect the lack of publicity that contract cheating has had. In this case, raising awareness is always beneficial to the academic community and the wider industry who will be employing our students in the future. Mark Graban discusseded two attempts by Crazylarry23, who self-identified himself as Australian, to cheat. One example included an ERP and Lean Manufacturing Essay, which Crazylarry23 insisted would “NOT be plagiarised”. This was outsourced to an author from Pakistan for $50. Mark Graban also fulfilled the detective role, identified in our research, finding the school in Australia that Crazylarry23 attended. This was near Crazylarry23’s stated location on Freelancer.com, although our own attribution attempts have shown that the listed locations are not always accurate. The spelling of “plagiarised” in this case, backs up the premise that Crazylarry23 was native to Australia. The role of the detective for contract cheating requests on agency websites often involves looking for trace evidence and small “clues” like these. Despite a number of our successes in identifying and attributing contract cheating cases, the sheer volume of these cheating attempts means that students are getting away with it. The academic community does need access to a semi-automated system to aid in the monitoring, collection of evidence and detective work. The good news is that Plagiarism Today reports that successful notification of Crazylarry23’s school was made, and since the user has now left Freelancer.com, we can assume that they were identified and penalised. Copies of the bid requests are archived elsewhere based on their RSS feeds for anyone interested. 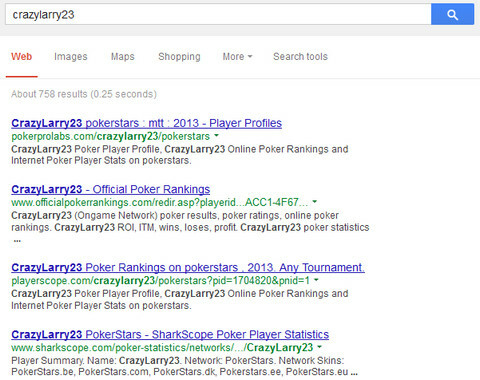 Whether this is the same Crazylarry23 who can be observed to be a keen poker player using a Google search remains to be questioned. There are still plenty of people like Crazylarry23 out there. We need to instil in our students the need for them to complete their own work and to demonstrate that they do have the skills required for success in the workplace. I did come across an interesting tweet from Freelancer during my investigation about what had been said about the Crazylarry23 saga on the Internet. Just Outsourcing identified that Freelancer.com was indeed complicit with the use of their site for the purposes of academic contract cheating, saying to @pheelpep, “We have had many ivy league students outsource their work on @freelancer.com 😉”. It has been speculated previously that the commission awarded to Freelancer.com through academic writing is substantial. This tweet provides a further indication which would mean that it contract cheating is not a problem that they would want to make a serious attempt to tackle. Just Outsourcing suggests that Freelancer.com should consider how they treat requests for academic work. The site adds that “The ramifications of assisting the generation of unqualified ‘professionals’ are too large”. In our own research, we have observed attempts by trainee teachers to outsource their assignments and requests for nurses to receive help with passing their training. It does seem that there are real risks involved with agency websites assisting with contract cheating requests which the academic and professional communities need to address. More details relating to this data set are academically available in our recent paper, “Commercial Aspects Of Contract Cheating” and several examples are expanded upon in Slides From Recent Talks by Thomas Lancaster. Just Outsourcing suggests that Freelancer.com should consider how they treat requests for academic work. The site adds that “The ramifications of assisting the generation of unqualified ‘professionals’ are too large”. We have observed attempts by trainee teachers to outsource their assignments and requests for nurses to receive help with passing their training. It does seem that there are real risks involved with agency websites assisting with contract cheating requests which the academic and professional communities need to address. Academic cheating is very common. Plagiarism for example is not dealt with firmly. Many publishers decline even to respond to someone reporting plagiarism in papers they have published.